There's clearly a lot of feeling surrounding this book if Mike DeLisa's review is anything to go on. Mike does raise a lot of questions and until they're answered then the controversy will continue. There's nothing new about popular books getting not so good reviews, or being attacked for missing facts - if you read the recent Open Letter To Gerard Jones, you'll see that none other than Joe Simon (who was there) has taken issue with Jones over his much lauded Men of Tomorrow book and a recent Marvel Masterworks introduction. These things happen. Where things go pear shaped is when people take pesonal pot-shots at others - if you don't agree with a review, or indeed don't agree with the book itself, then by all means, voice your opinion. However once you bring things into a personal attack then you can assured that your views will just be redundant. If you're in Adelaide this Friday then you'll be wanting to check this one out. Artist MICHAL DUTKIEWICZ (Batman, Wolverine & Lost in Space) and writer PAT MCNAMARA (Co-Creator of The Unknown Soldier). 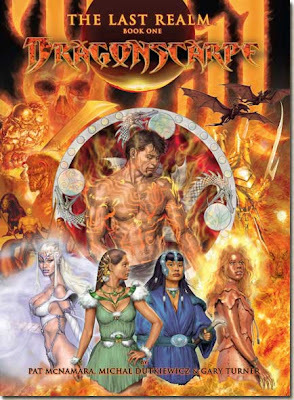 Both men will be signing copies of their just released book, THE LAST REALM: DRAGONSCARPE. This event is exclusive to Adelaide Comic Centre, and more details can be found on their web-site, or by visiting the store or giving them a call: Shop 15, Citi Centre Arcade, Rundle Mall, Adelaide, South Australia, phone 82235593. I'll be popping in for a few minutes to take some happy snaps, not that my attendance will get people flocking in, but hey - it'll be a damn good day I'm sure. 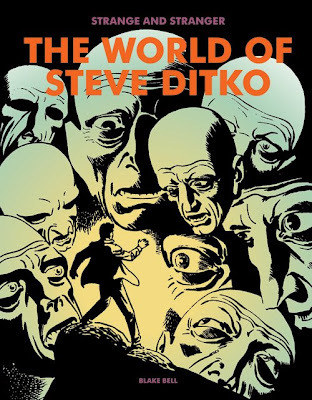 Some Thoughts on Some Thoughts on Blake Bell's Book, or Did Steve Ditko Once Play Baseball?